A ‘wild relative’ is the natural counterpart of a domesticated plant; an ecological memory of biodiversity before industrial methods of agriculture transformed the planet. It might be long extinct since the moment of domestication, or forgotten about in the path of cultivation. In a melting anthropogenic world of rising temperatures, sea levels and emissions these plants have become an increasingly sought-after and critical resource for the development of crops that ensure future food security. 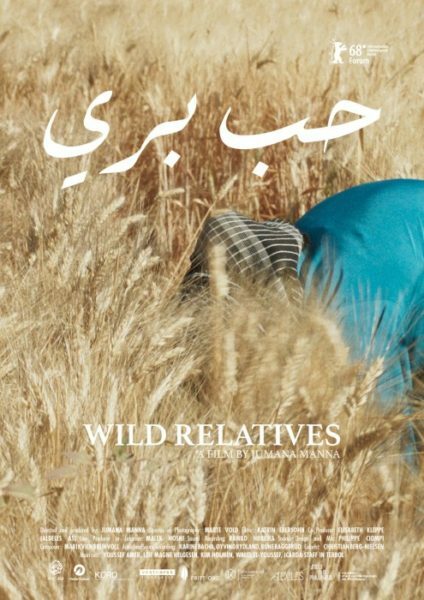 Jumana Manna’s Wild Relatives, premiered at this year’s Berlinale, follows the trajectories of some of these treasured species and the people who care for them. We witness as seeds travel in sealed black plastic boxes from the International Center for Agricultural Research in the Dry Areas (ICARDA) in Lebanon to the Global Seed Vault on the Norwegian archipelago of Svalbard, where they will remain frozen and sheltered at around -18C for the foreseeable future… or until an emergency asks for their retrieval. While the seeds take centre stage it is these two organisations and their webs of control that the critical dimension of Manna’s work is really aimed at. The Global Seed Vault functions as an embodied insurance policy for research institutes and national seed banks globally by storing identical backups of their collections in case anything should ever happen to them, or the buildings that home them. It has been in the spotlight of anthropogenic image circulation since its opening in 2008 and actively plays with its association as a ‘doomsday’ vault for a post-apocalyptic world. The first accession of stored seeds came surprisingly soon in 2015 and was triggered by the violence of the Syrian war, which caused the relocation of ICARDA’s genebank in Aleppo. Drawn in by the media attention surrounding the initial transfer of seeds from the Global Seed Vault to ICARDA’s new home in the Bekaa valley in Lebanon, Wild Relatives follows the seeds as their journey comes full circle and they return to the Global Seed Vault two years later, after having been reproduced and grown out in ICARDA’s facilities. Focussing on the development of food crops with minimal resource usage for the conditions of ‘dry lands’, ICARDA is part of a global network of scientific research institutes called CGIAR, the Consultative Group for International Agricultural Research, one of the main drivers of the Green Revolution. This revolution stands for the ironically named set of agricultural practices developed in the 1940s-60s which resulted in the techno-scientific production of high-yield varieties to ‘save the developing world from starvation’ and simultaneous commodification of plant genetic resources. It was driven by US-led agri-business and organisations such as the Ford and Rockefeller Foundations. Close up of ICARDA’s wheat fields. Credit: Jumana Manna. The setting of seed’s journey is definitely a complicated one; it is entangled in the geopolitics of planting, science research practices and national and cultural claims to the ownership and control of seeds, and by extension – ‘nature’. It bridges borders as well as temporalities and life cycles. This blurriness of good intentions and structural violence towards farmers already is indicative of the sensitive line between the essentialising of practices, the neoliberal institutional politics they embody, and the complex stories of the deeply caring individuals involved in these organisations. The film manages to make these practices tangible rather than demonise. It does this through a gaze that prefers close ups and a focus on small gestures and mundane tasks instead of feeding into the totality of image production surrounding the Global Seed Vault, which tends to be in awe of the vault’s monumental, cathedral-like architecture. Manna’s film weaves together fragments of the seeds’ journey from their vacuum packing and storing in a busy minivan to their arrival and unpacking at the Global Seed Vault in the midst of a photo shoot. From field workers dancing to the sounds of pebbles being shaken in plastic bottles to deter birds from eating away at the crops, to Walid, a Syrian farmer in Lebanon, cultivating a field near his new home according to sustainable agricultural methods practiced by his relatives and influenced by an informal, dispersed network of farmers, the narrative opens up space for those at the periphery of ‘scientific’ practices and the technocratic beliefs and economic structures hidden amidst the well-meaning and scientifically ‘objective’ languages of institutions such as the Global Seed Vault and ICARDA. Through the prism of these sidelined experiences it becomes clear that seed banking and the care for seeds can also operate as private acts of resistance, both towards the conditions imposed by the upheavals of war, as is the case for Walid and the field workers, and towards the larger economic interests and attitudes embodied by organisations like ICARDA towards farmers, their creativity and specialist knowledges. Already the reference to the region as ‘dry lands’ holds a colonial attitude in that it frames these areas as in need of scientific research, help and support rather than acknowledging that the farmers here have shown incredible self-sufficiency and expertise in cultivating species which are very low on resource consumption of water and other additional inputs. Conversation between a priest and a scientist in Svalbard. Credit: Jumana Manna. 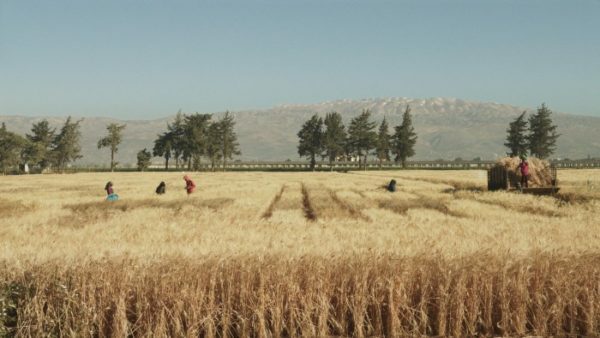 Amidst this, Jumana Manna leaves room for the landscapes involved in the nurturing and homing of the seeds – the green Bekaa valley in Lebanon and the grey shrubby rubble of Svalbard’s hills in the summer. 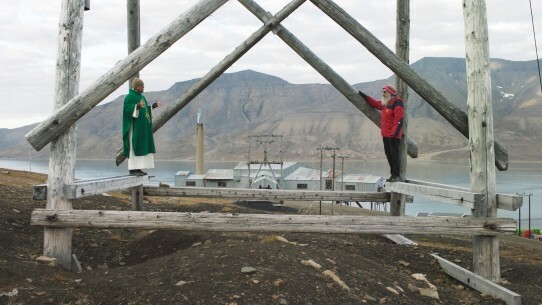 A conversation between a priest and a scientist (while they are slowly climbing around the wooden structure of the cable car which used to connect to the island’s main coal mine) reveals, that Svalbard is as much suffering from the impacts of climate change as the dry lands – the polar bears are coming closer into town, new species are arriving, the glaciers retreating. Vulnerability and displacement are red threads throughout the many sub stories. And this vulnerability extends to all involved. In May 2017 the Global Seed Vault flooded after an unexpected melting of permafrost, disclosing just how error-free technocratic humanist solutions can be. This physical fragility of the institutions, whether the Global Seed Vault or ICARDA, points to the need of cultivation and preservation as acts of the present rather than delayed promises for the future. As we follow the seeds’ fluid movements across borders and climate zones it becomes increasingly clear that they need to be cultivated, cared for and given land to grow in order to hold real value and diversity. While the sociopolitical backdrop needs some unravelling, the film’s language is direct and captures the seductive qualities of the skill of plant cultivation as local heritage, scientific practice and the spaces inbetween and beyond. Closeups of hands as they artificially pollinate plants, dissect, handle, wash, package, prune and run through soil to assess its quality feature at many stages of the film and it is this labour and dedication that the film respectfully acknowledges and gives space to. It comes across as a particularly gendered labour across all levels and hierarchies of the organisations. From Maria Haga, the director of the Crop Trust, accepting the seeds on their return to the biotechnologist specialised on double haploid plant genetics who is interviewed at ICARDA and the group of Syrian refugee women who work in ICARDA’s fields in the Bekaa valley, the majority of those involved in the care for seeds are women. As is the case for the majority of keepers of agricultural knowledge globally. Focussing on these gestures of care gives room for the consideration of the complex biopolitical property structures at the heart of seed banking – who looks after the seeds that could determine humanity’s food security in the future? Who can access these collections and their black boxes? And what skills and knowledges are necessary to maintain the co-dependency of humans and plants if insurance policies need to be cashed in? Or as the film’s closing song asks nostalgically, ‘after us, who will visit the grape vines’? It is hard to make food security and the fallout of climate change into emotional subjects and reveal the sense of urgency and survival at stake. 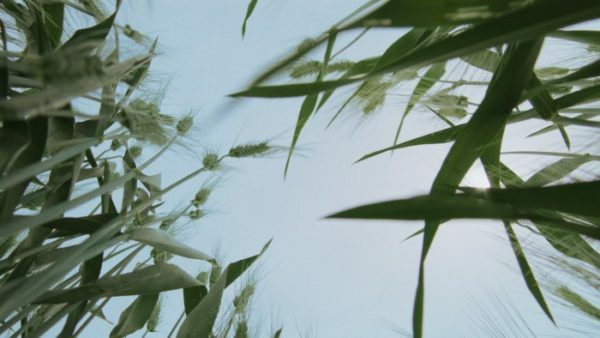 Jumana Manna’s film manages to do exactly that, without romanticising the idea of seed-saving but also without shying away from the political implications and future visions at stake in the different practices and their claims to the ownership of plants. Jumana Manna is an American born Palestinian artist and filmmaker. After studying at the National Academy of Arts in Oslo, she earned a master’s degree in Aesthetics and Politics from the California Institute of the Arts in Valencia, Loss Angeles County, USA. Her works have been shown in solo exhibitions including Chisenhale Gallery, London (2015), Malmö Kunsthall (2016), Sculpture Centre New York (2014) and CAPC, Bordeaux (2017). In 2017 she was nominated for the Preis der Nationalgalerie. Filmography: 2010 Blessed Oblivion; 21 min; The Umpire Whispers; 15 min; 2013 The Goodness REgime; 21 min., co-directed by Sille Storihle; 2016 A Magical Substance Flows Into Me; 68 min., Forum 2017; 2018 Wild Relatives. Marleen Boschen studied Fine Art at Chelsea College of Art and Design, London and is currently completing her MA in Global Studies at the IAAW, during which she spent semesters at FLACSO, Buenos Aires and Chulalongkorn University, Bangkok. From 2013-16 she co-ran the artist-led organisation and project space Auto Italia, London and has been a visiting practitioner at the University of the Arts, London since 2014. Her research interests include plant geopolitics, anthropogenic image making, biopolitics and gender, affect theory, mental health, and dystopian/utopian thought. She is currently working on her MA thesis on visualisations of care and control in seed banking practices.